Welcome to the British Columbia Frequency Modulation Communications Association (BCFMCA). We are an Amateur Radio organization specializing in VHF, UHF, and microwave communications. We operate equipment in a variety of modes, including FM, DMR/MotoTRBO, IRLP (node 1694), and D-STAR. Please select one of the menu buttons on the left to find out more about us. The BCFMCA is a registered charity with the Canada Revenue Agency. We accept all monetary and in-kind donations, and can issue tax receipts for donations over $25. We gladly accept charitable donations of estates from "silent-key" amateurs. Please see the "How to Reach Us" button on the left menu to get in touch with our Executive. If you notice that the Power Status is "On Battery", please refrain from using the repeaters unless you have emergency or priority traffic. More temperature telemetry is available here. More power plant telemetry is available here. Please see Events and News for more information. A historic day today on Mt. Seymour. After more than 25 years in service, VE7RPT-VHF is no longer running on the Motorola Micor platform. Today, VE7FET replaced the Micor with a new Motorola SLR5700 repeater, coupled to a Glenayre 100W VHF PA. This is one, of many, steps in upgrading our analog repeaters to some new technology. While the new repeater is currently (still) connected to the RLC-3 Controller, at some point (in the new year) it will get a new controller and also get upgraded to support receiver voting. The Glenayre 100W PA lets us boost the output of the new Motorola repeater up to 100W, putting about 65W up the coax, after the duplexer. This also allows us to unload some draw from the DC battery plant, as the Glenayre PA is powered directly from AC (the Micor was all DC). In the event of AC failure, the repeater will revert to 5W (approx) output. Yes, it is that time of the year once again... indeed, it is time to renew your BCFMCA membership! Renew on-line, it is simple and fast! Online we accept VISA and MASTERCARD for on-line payment through PayPal. Save a stamp! Renew right now! Never been a member before? We'd love you have you show your support for amateur radio and volunteer emergency communications in the Lower Mainland! You can join right now! Click to start a membership application. It is YOUR support that helps to maintain eight repeaters at one of the most sought after locations in the Lower Mainland! Today, our D-STAR server was upgraded from ICOM G2 to ICOM G3 Gateway Software. Please be patient while we work through the migration and get a feel for some of the new options. We've added a Letsencrypt SSL certificate to the DSTAR gateway server. That means that you should no longer see warnings when you try connecting to the registration gateway or the status page (unless you are still running Windows XP... and that is your own problem to fix). Finally got around to updating our building move page with more pictures and information. As of late August 2013 we installed our first DMR/MotoTRBO repeater at the Mt Seymour site. 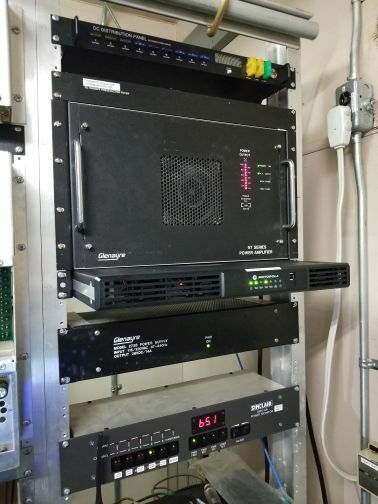 This repeater now occupies the VE7RAG 443.400MHz frequency in place of the D-STAR repeater that used to occupy this frequency. D-STAR is still available on VE7RAG VHF and 1.2GHz. We are excited to start experimenting with DMR technology as it utilizes TDMA (Time Division Multiple Access) to accommodate two simultaneous data/voice streams on a single 12.5KHz channel. The VE7RAG 443.400MHz repeater is also configured with internet linking using IPSC (IP Site Connect). This allows repeater users to connect to over 300 other DMR amateur radio repeaters around the world. More information on the new DMR repeater can be found here. We've done some major work on our emergency power system, replacing the batteries and charging system. You can read more about that project here. The new equipment lets us easily gather remote telemetry/statistics, which you can see here. You will notice on the top of this home page, you can see whether the equipment is running on AC or on battery. The status is effectively live (it is polled every minute), and is current when you load this page. If you notice that the system is running on battery, please refrain from using the repeaters unless you have emergency or priority traffic. We also have telemetry for temperatures inside and outside our building, which you can see here. More ways to talk to the world! We are node number 1694 on the IRLP network, and normally IRLP will be linked to VE7RPT-VHF and VE7RPT-UHF. Don't be surprised if you hear someone connect with a callsign from another part of the world! Transmissions from the IRLP port can be identified by the CW "I" courtesy tone at the end of the calling party's transmission. In order to "dial out" and connect VE7RPT to another IRLP node, you will need to be a BCFMCA member. More details on IRLP and our system can be found here. Months of hard work tracking various sources of malicious interference directed at the VE7RPT repeater, owned and operated by the BCFMCA and located on Mt Seymour, have finally begun to pay off. On September 25th the FCC issued a Notice of Apparent Liability, including fines totaling $7,000, to James Grinton, K7VNI, located in Bellingham Washington. A copy of this notice is attached for your information. Grinton repeatedly and maliciously interfered with the operation of VE7RPT on a frequent basis. During the last 2 years Grinton directed his malicious interference and harassment at the President of the BCFMCA, jammed phone patches and periodically flooded the repeater with music and other forms of intentional interference. In early 2006 a team of Canadian Hams began tracking the interfering signals and quickly determined they originated south of the Canada/US border. A group of Hams in the US were approached to provide assistance and the source of the interference was identified shortly thereafter. A number of independent confirmations were made to verify the location, the address of which was determined to be that of James Grinton, K7VNI. A complaint was formally made to the FCC regarding this interference and the information collected by the combined Canadian and US tracking team was provided to the Seattle office of the FCC. An agent from the FCC Enforcement Bureau’s Seattle Office independently verified the location and source of the interference during late 2006 and a Warning of Interference to Communications Letter was sent to James Grinton, K7VNI, on January 19, 2007. Grinton continued to interfere with the operation of VE7RPT after receipt of the warning letter. In fact, the Seattle agent recorded over 160 violations during the period January 19, 2007 to June 23, 2007. A Notice of Apparent Liability, including fines totaling $7,000, was issued to James Grinton, K7VNI, on September 25, 2007 (see notice). This is the second of a series of interference complaints affecting repeaters in the Greater Vancouver area to be brought to a conclusion. Additional interference investigations are on-going. Many thanks to all the people who devoted countless hours tracking and identifying the source of this interference. This is an excellent example of the tremendous spirit of cooperation that exists between Amateur Radio operators in both Canada and the US. In addition, many thanks to the Seattle office of the FCC for their support and subsequent enforcement action. Membership is open to all licensed amateur radio operators. If you are not a member, why wait? Join NOW! See here for details. QRM is a problem, we all know that. We will try and locate possible sources of interference on the repeaters, but we need YOUR help. Please submit a QRM report so that we can try and locate the source. It is important to fill out the report EVEN IF YOU DON'T HEAR the interference from your location when it occurs. Remember to listen to the INPUT of the repeater when listening for interference. Don't think that your report has an effect? Well, see the press release above. James Grinton was busted by the co-ordinated efforts of a number of volunteers. All information reports are useful. Are YOU causing QRM on our repeaters? Again, be warned, you never know who is lurking around your neighbourhood gathering evidence for prosecution. We've been at this at lot longer than you, and we're not going to let you destroy our resource... and we've got the law on OUR side. Curious as to the coverage of some of our repeaters? Please see the Equipment page for more information. Thank you for visiting our website and 73. This page was last updated 28 December 2018. Space for our equipment on Mount Seymour is provided courtesy of Mount Seymour Resorts. The BCFMCA acknowledges the financial assistance of the Province of British Columbia. Bandwidth and hosting provided by the BC Wireless Amateur Radio Network.